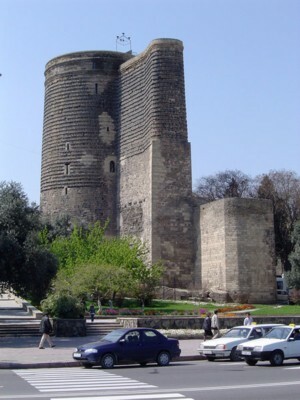 The 12th-century Maiden Tower (Giz Galasy) is built over earlier structures dating from the 7th to 6th centuries BC in Baku (Apsheron peninsula ) The heavy structure of the Maiden Tower is anchored to a rock that slopes into the sea. The structure is 16-16.5 meters in diameter and rises eight levels to tower above all the buildings of the old "Inner City" of Baku. Azerbaijanis are incredibly proud of this monument that is shrouded in mystery and legend even though scholars and historians are unable to speak with absolute authority about its origins.